We are currently testing a feedback/comments system for PhilippineCompanies.com utilizing Facebook comments plugin. This plugin allows users to leave feedback or comments on a business listing using their Facebook account. Scroll down to the bottom of a business listing to leave a comment. This site highlights the latest news, events, updates and features of the Philippines' leading business locator and directory. 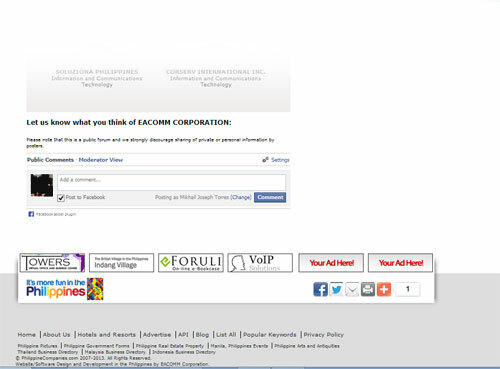 PhilippineCompanies.com is proudly brought to you by EACOMM Corporation.